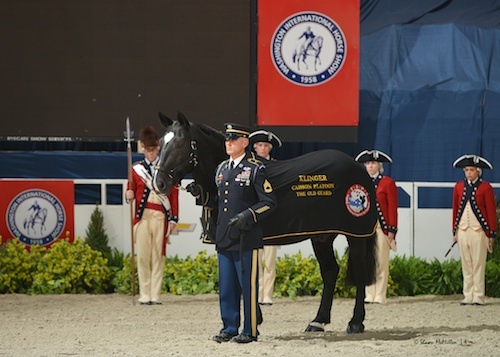 WASHINGTON, Oct. 14, 2015--–The Washington International Horse Show (WIHS) will welcome and honor current and former members of the United States Armed Forces to Verizon Center on Friday, October 23, for the fifth annual WIHS Military Night, presented by The Boeing Company. 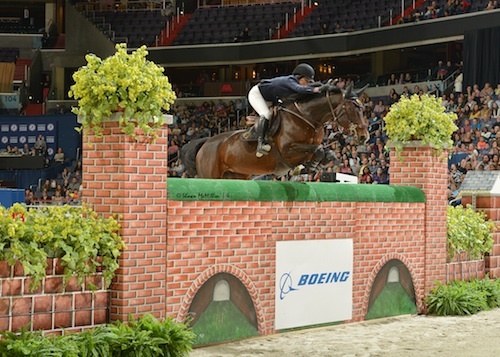 The night will highlight Boeing's $25,000 International Jumper Puissance High Jump class alongside the $50,000 International Jumper Speed Final, presented by Rushy Marsh Farm and AAA Equestrian. 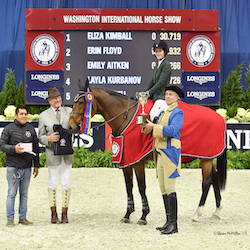 Competition at WIHS will begin Tuesday, October 20, and continue through Sunday, October 25.
at the 2014 WIHS. Photo © Shawn McMillen Photography. 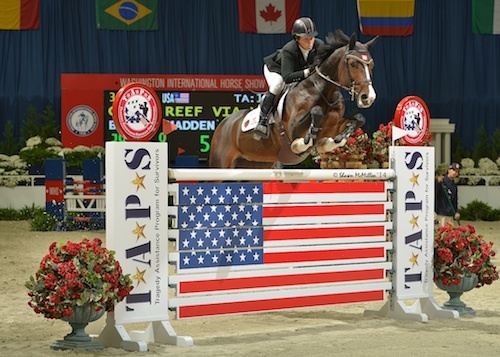 The $50,000 International Jumper Speed Final will host the “Jump for TAPS” Challenge to raise funds for The Tragedy Assistance Program for Survivors (TAPS), the WIHS Official Military Charity. Each time the jump is cleared, a monetary donation will be made to TAPS, an organization devoted to caring for the families of fallen heroes with immediate and long-term support. In 2014, Jessica Springsteen of Colt’s Neck, NJ, an up-and-coming U.S. show jumping star, captured top honors in The Boeing Company $25,000 Puissance aboard Stone Hill Farm’s Lisona, clearing the famed brick wall obstacle set at 6’10” in the final ride of four rounds. The North American Indoor Puissance record of 7’7 ½” was set at WIHS in 1983 by Anthony D’Ambrosio and Sweet ‘N Low. The puissance high jump at WIHS continues to be a crowd favorite each year, showcasing the versatility and athleticism of the horse while simultaneously featuring some of the best riders in the world in an entertaining and electric atmosphere. 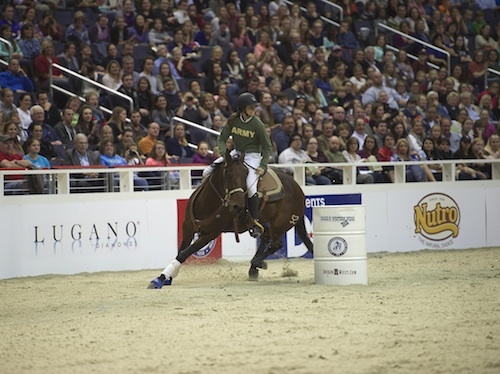 Jessica Springsteen and Lisona won the 2014 The Boeing Company Puissance. The Army v. Navy Celebrity Barrel Racing Competition, presented by Washington Area Chevy Dealers, will pair representatives from the U.S. Navy Equestrian Team and U.S. Army Caisson Platoon with top international show jumping riders and some of the nation’s fastest professional cowgirls affiliated with the National Barrel Horse Association, Women's Professional Rodeo Association and American Professional Rodeo Association. The teams will represent the rival branches of the U.S. military in a fun and entertaining barrel racing competition. 2014 barrel racing competition, presented by Washington Area Chevy Dealers. Photo © Alden Corrigan Photography. The third annual Klinger Award will be presented during Military Night. Named for the beloved U.S. Army horse and TAPS Ambassador, the Klinger Perpetual Award for Honor and Service, presented by Ariat International and EQUUS Foundation, recognizes a horse, individual or organization that best demonstrates the values of honor and service as embodied by Klinger, a special horse who has touched the lives of many in his life of service with the 3rd U.S. Infantry Regiment (The Old Guard) Caisson Platoon. Klinger will be on hand for the ceremony. Klinger stands tall in last year's presentation. Photo © Shawn McMillen Photography. The Armed Forces Reception will begin at 7 pm in the Acela Club and funds raised at the charity event will benefit local therapeutic riding programs serving the military community, including the Northern Virginia Therapeutic Riding Program, Maryland Therapeutic Riding, Therapeutic & Recreational Riding Center, Loudoun Therapeutic Riding, and Rainbow Therapeutic Riding Center. Tickets are $150 and include dinner and open bar. Tables are also available. Both can be purchased by calling 202.525.3679 or visiting www.wihs.org/social-events/. For more information on Washington International Horse Show please visit www.wihs.org or to see a full schedule for WIHS Military Night on Friday, October 23, visit www.wihs.org/military-night/. To purchase general admission tickets for WIHS Military Night, please visit www.Ticketmaster.com. The WIHS Military Ticket Program provides complimentary tickets to local area military families to experience an exciting evening of international level show jumping and equestrian entertainment. Since 2010 WIHS has donated more than 16,500 tickets thanks to the support of Fidelity Investments®, The Boeing Company, the Travelers Companies, Inc., Waldron Wealth Management, Glen Senk and Fashion Farm, Cherry Knoll Farm and Rothwell Figg, Ernst & Manbeck.